Includes 1/8", 3/16", 1/4", 5/16", 3/8", 7/16", 1/2", 9/16", and 5/8"
Collet and Chuck set for lathes with a 2 Morse taper spindle taper. Includes nine ER-25 collets, 3/8"-16 drawbar thread, spanner wrench and case. Collet and Chuck set for lathes with a 3 Morse taper spindle taper. Includes eleven ER-32 collets, 3/8"-16 drawbar thread, spanner wrench and case. Collet and Chuck set for mills with a R8 spindle taper. Includes eleven ER-32 collets, 7/16"-20 drawbar thread, spanner wrench but no case. Set of seven 2 Morse taper round collets. Made of high grade tool steel these collets have been hardened and ground to close tolerance. This Morse taper collet set includes seven 2MT collets sizes: 1/8", 3/16", 1/4", 5/16", 3/8", 7/16", and 1/2". Includes 1/8", 3/16", 1/4", 5/16", 3/8", 7/16" and 1/2"
The thru bore of the collets is 0.467". The 1/2" collet is bored to 1/2" by 0.66" deep. All the other collets will pass the full material size through the length of the collet. Set of eleven 3MT round collets that work with a wide variety of lathes. Made of high grade tool steel, hardened and ground to close tolerance. This set comprises the "missing" collets from our seven piece set. Set of seven 3 Morse taper round collets. Made of high grade tool steel these collets have been hardened and ground to close tolerance. Includes seven 3MT collets sizes: 1/8", 3/16", 1/4", 3/8", 1/2", 5/8", and 3/4". Set of 17 5C collets gives you maximum flexibility in matching your workpiece size for secure holding. Set of six 5C collets in common sizes ranging from 1/8" to 3/4" by 8ths. Includes 1/8", 3/16", 1/4", 5/16", 3/8", 7/16", and 1/2"
Set of seven Brown & Sharpe round collets to fit spindles with a Brown & Sharpe taper. This set ranges from 1/8" to 1/2" by 16ths. Set of eleven Brown & Sharpe round collets to fit spindles with a Brown & Sharpe taper. This set ranges from 1/8" to 3/4" by 16ths. This set of ER-20 collets provides the basics you need for the Tormach Tooling System. Full range of collets hold all work sizes from 0.04" to 0.629"
Includes 1/16", 3/32", 1/8", 3/16", 7/32", 1/4", 5/16", 11/32, 3/8", 13/32", 7/16", 1/2", 17/32", 9/16", and 5/8"
Full range of collets hold all work sizes from 0.08" to 0.787"
Includes 3/32", 1/8", 3/16", 7/32", 1/4", 5/16", 11/32, 3/8", 13/32, 7/16", 1/2", 17/32, 9/16", 5/8", 21/32, 11/16", 23/32, and 3/4"
Includes 1/8", 1/4", 3/8", 1/2", 5/8", and 3/4"
Full range of collets hold all work sizes from 0.12" to 1.02"
Includes 1/8", 3/16", 7/32", 1/4", 5/16", 11/32, 3/8", 13/32, 7/16", 1/2", 17/32, 9/16", 5/8", 21/32, 11/16", 23/32, 3/4", 25/32", 13/16", 2732", 7/8", 15/16", 31/32" and 1"
These collets fit all MICROMOT machines, except the engraver GG 12. One each in size 3/64", 2/32", 5/64", 3/32", 7/64" and 1/8" (1.0, 1.5, 2.0, 2.4, 3.0 and 3.2 mm) come as a set in a practical holder for storage along with one clamping nut. Set of 10 R8 round metric collets sized 3, 4, 5, 6, 8, 10, 12, 14, 18, and 20 mm. Made of high grade steel, these collets have a 7/16" -20 internal drawbar threading. Set of eleven R8 round collets sized from 1/8" to 3/4" by 16ths. Made of high grade steel, these collets have a 7/16" -20 internal drawbar threading. These are high precision professional grade collets with 0.0005" runout or less. Set of 23 R8 round collets sized from 1/16" to 3/4" by 32nds provide maximum flexibility in tool fitting. Made of high grade steel, these collets have a 7/16" -20 internal drawbar threading. Includes 3/16", 3/8", 1/2", 5/8", 3/4"
This set includes most the sizes required for common end mills. Includes 1/8", 1/4", 3/8", 1/2", 5/8", 3/4"
Set of six R8 round collets sized from 1/8" to 3/4" by 8ths. Made of high grade steel, these collets have a 7/16" -20 internal drawbar threading. Sizes from 1/8" to 3/4" by 8ths, plus 3/16"
Includes 1/8", 3/16", 1/4", 3/8", 1/2", 5/8", 3/4"
This set includes all the sizes required for common end mills. This collet set is made for Taig Micro Lathes and Micro Mills. This collet set works with our 1915 arbor to make an economical small collet chuck for the mini lathe or mini mill. 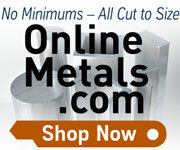 Collets are used to hold small diameter workpieces and small diameter end mills. This set includes the collet closing nut and 8 collets. The collets are 1/8", 5/32", 3/16", 7/32", 1/4", 9/32", 5/16" plus one blank collet. These collets normally accept material that is 0.001" inches over the collet size and 0.004" inches under the collet size. Bar stock is usually within this range. Fits the spindle of the Nano Mill, Nano Lathe, Nano Drill Press.